The scruffy gray dog was at the South L.A. Animal Shelter when Elissa and Nick Andre saw his listing on Petfinder. 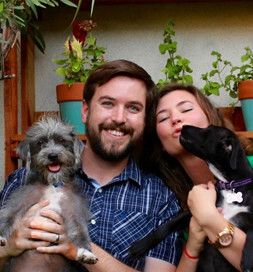 They weren’t yet married but wanted to adopt a dog together and had been searching the website and visiting shelters in a 25-mile radius of Los Angeles. “It felt as if every time I’d fall in love with one, it would be adopted right out from under our noses,” Elissa says. They weren’t taking any chances when they saw this dog. They waited outside the shelter on the day he was available for adoption to make sure they would be first in line. And they succeeded. “I’ve never known such a close, instant bond with an animal,” Elissa says. “The first day we had him, he stood up on his hind legs, wrapped his front paws around Nick’s knee and gave him a hug, then ran over to me and did the same thing. He still gives us hugs every day!” It’s no wonder that their friends say he is a human trapped in a dog’s body. They named him Pickles. “A silly name for a silly dog,” Elissa says. They really had planned to let the wedding dust settle before adopting another dog, but looking online was no way to do that. Just a week after the wedding, “there was Olive, up for adoption through a local rescue group,” Elissa says. “Her picture was exactly what we had imagined our hypothetical second dog to be.” They arranged to bring her home for a night to see how she and Pickles would get along. Pickles helped make the decision. “Seeing them romp around the yard with a toy and wag their tails at each other that first night just made my heart sing,” Elissa says, “and there was something about her soulful eyes and gentle puppy kisses that we couldn’t deny.” They adopted her the next day. “I tried to think of some fun black-dog names over the next week and loved the name Olive even before it occurred to me we’d be naming both our pups after condiments. Pickles and Olive are just the right “condiments” to flavor Elissa and Nick’s family with love and joy.